Populate Any Classroom, Conference Room Or Training Environment With Thesis Training Chairs. Thesis Brings A Range Of Functional Design And Space-Saving Flexibility To Any Environment, And Outperforms With Comfort, Style And Efficiency. 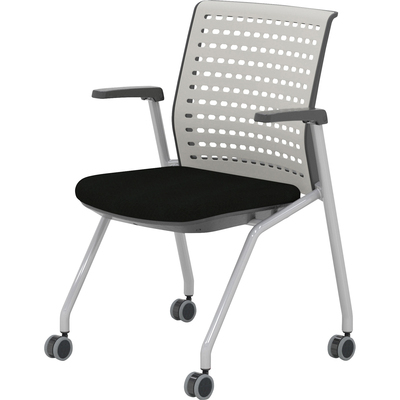 Stationary Gray Poly Backrest Features Contoured Support. The Cushioned, Fabric Seat Offers Extended Seated Comfort And Flips Up For Compact Nesting And Stacking Storage. Chairs With Arms Roll Easily On Casters. They Have A 250 Lb. Weight Capacity And Meet Ansi/Bifma Performance Criteria. Stack Up To Four High. Arms Flip Up And Out Of The Way..
Populate Any Classroom, Conference Room Or Training Environment With Thesis Training Chairs. Thesis Brings A Range Of Functional Design And Space-Saving Flexibility To Any Environment, And Outperforms With Comfort, Style And Efficiency. Stationary Gray Poly Backrest Features Contoured Support. The Cushioned, Fabric Seat Offers Extended Seated Comfort And Flips Up For Compact Nesting And Stacking Storage. Chairs With Arms Roll Easily On Casters. They Have A 250 Lb. Weight Capacity And Meet Ansi/Bifma Performance Criteria. Stack Up To Four High. Arms Flip Up And Out Of The Way.